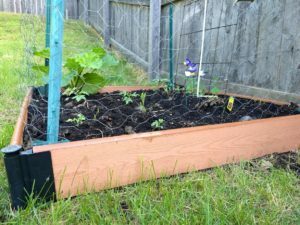 EDITOR’S NOTE: Updated May 22, 2018, with additional photos of the raised garden bed. 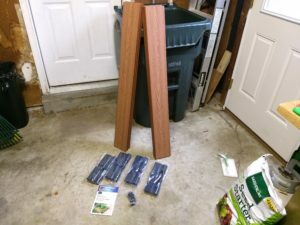 Today, I’m looking at Aldi’s Special Buy (ALDI Find) Gardenline Raised Garden Bed. 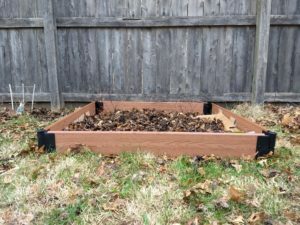 I already own two raised garden beds that my husband helped me assemble with cedar boards from a local hardware store, and I decided to add the Aldi raised garden bed to my collection this spring. 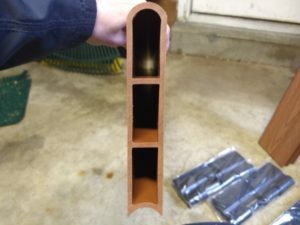 The kit is manufactured by Frame It All, which sells an interesting variety of garden bed kits and accessories for those beds ranging from greenhouse attachments to fencing to butterfly house enclosures. They also market sandbox kits for children. The Aldi garden bed has a five-year warranty, although it should be noted the manual states you must pay transport costs for replacement pieces. The raised garden bed kit sells for $29.99 at my local Aldi. A similar bed is on Frame It All’s site for $59.99, so price wise this seems like a pretty good deal. However, you also have the option to purchase three kits and make a double layer garden bed that would be 11 inches deep. The manual includes instructions for building a hexagon or rectangle raised bed using three kits. The manual states the “boards” for the raised bed are composite wood grain timbers, but they really feel like mostly plastic. They also have a hollow, honeycomb type of appearance if you look inside them through the ends. A view of the end of one of the composite boards. When you open the box, here’s what you get: four “boards” (mine are leaning against each other in the photo below, so it looks like there are only two, but there really are four), several bags containing joint stakes and brackets, joint caps, screws, and a manual. You’ll need a hammer or mallet and a power drill or screwdriver for assembly. The power tool is especially important because you’ll be drilling screws into the composite boards, and there are no preexisting holes for the screws to go into. Assembly takes 15-30 minutes. 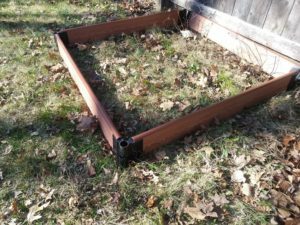 To assemble the raised bed, you slide brackets onto the ends of the boards and screw the brackets on to hold them in place, making sure the brackets on each end of each board are flipped compared to the other. The instructions say that you can use a power drill or screwdriver, but my husband found it much easier using a power drill. Also, the instructions don’t say anything about drilling pilot holes. You can if you want to, but the screws seem to drill in fine if you simply use the screw to bore into the composite. Whatever you do, though, be careful not to over tighten the screws, as that can damage the board. Once you’ve screwed the brackets in on all four boards, it’s time to turn them into a raised box. You select your desired location for the garden bed, then lay the four boards out in a square shape (or however you’re shaping your bed if you purchased more than one kit). You then insert a stake into each bracket and use a mallet (or hammer, but be careful) to drive it into the ground. A joint cap goes over the spikes and you’re done. Two of our joint caps didn’t pop on securely, but that doesn’t have much effect on the garden bed’s functionality. The manual mentions that if you’re placing your raised garden bed on cement or another hard surface, you can use a hacksaw to remove the spike from the stakes. The manual also gives brief instructions on how to stack a second or third raised garden bed kit for multi-level designs. I placed my garden bed in my back yard in an area that was already partially in use as a garden bed with some small blueberry bushes. I framed in the bushes when I laid out the bed pieces. Placing the raised garden bed, before I added the corner stakes. Then I broke down the box that the garden bed came in and also flattened the box my Aldi 4-Tier Greenhouse came in and laid those on the ground inside the raised bed to help kill the grass. I added a layer of mostly finished homemade compost, and in a few weeks when I pull my patio furniture out of winter storage in my shed, I’ll be able to reach several bags of store-bought garden soil left over from last season that will hopefully fill up the rest of the bed. The corners are staked in, and the bed is filled with cardboard to kill the grass, along with a bit of mostly finished compost/leaves. It’s ready for garden soil and plants. 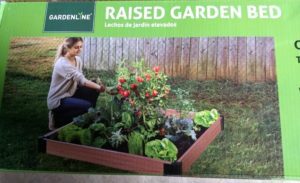 Aldi’s Gardenline Raised Garden Bed seems competitively priced, especially considering the same bed sells for $60 on the manufacturer Frame It All’s website. I paid $40 last spring at a local hardware store for untreated cedar boards and deck screws to build just one 4-foot-by-2-foot, 12-inch-deep raised bed with 1-inch-thick walls, so paying $30 for the Aldi raised bed that is 4 feet by 4 feet and nearly 6 inches deep sounds pretty good. The downside is that the Aldi raised garden bed is not as deep. To achieve a deeper garden bed, you’d have to buy multiple kits and stack them, which ups the cost. Even then, though, I don’t think the cost is unreasonable. The assembled bed looks nice in my yard and seems fairly sturdy. I’ve had it for nearly two months now and it seems to be holding up well. I even moved it before adding plants, and it was a simple process to pry up the corner stakes and move and reassemble the bed. I’ll be watching to see my how Aldi raised garden bed continues to hold up with use and time. Check back here later for updates. 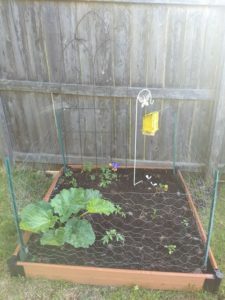 In the meantime, here are the most recent pictures of my raised garden bed, taken in late May. 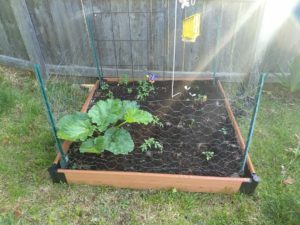 The bed has rhubarb, tomatoes (which got chomped by local rabbits, prompting me to put up the chicken wire fence), strawberries (also significantly reduced by bunnies), and sugar snap peas. I purchased the Aldi Gardenline Trellis in the back of the raised bed a few years ago. Also, the tomato plants in the bed were grown from seeds purchased from Aldi this spring. 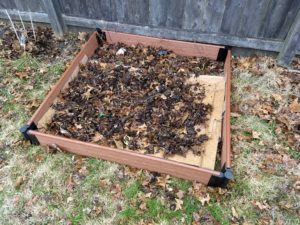 Aldi’s Gardenline Raised Garden Bed is competitively priced and looks good in my yard. If you’re looking to start a garden or expand your garden, this seems like a decent product. Hi, I was wondering how this held up through the summer. I just purchased three of a sale site and wonder what your thoughts are now. Thank you. It has held up great. I’m happy with it.